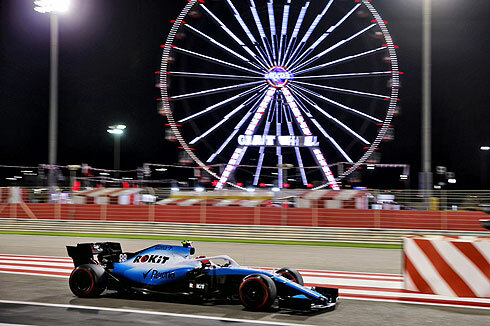 The second Friday practice session for the 2019 Bahrain GP would again see the ROKiT Williams Racing team finish at the bottom of the times. 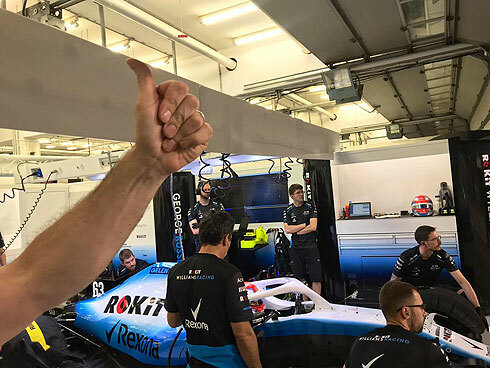 George Russell would finish ahead of team-mate Robert Kubica in a session that would see both drivers complete supersoft tyre runs prior to switching to a splt tyre assessment with George on the hard tyre and Robert the medium. Small piece of encouraging news was the fact that George had reduced the gap to the fastest car in front to around 0.8 while in Australia it was 1.5 seconds. 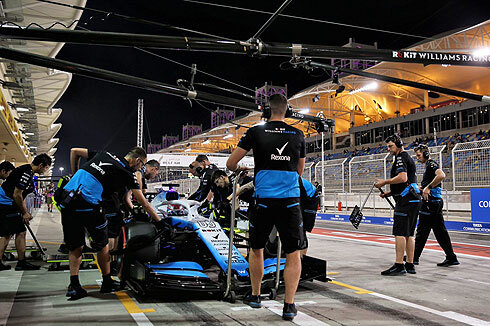 With the lights on the second Friday practice session would get underway for the 2019 Bahrain GP. A 1m:32.932 from Ricciardo but Vettel would move ahead with a 1m:30.610 running on the medium tyre. a 1m:30.203 from Leclerc to see him quickest. After their first runs the Williams drivers were 12th and 14th after supersoft tyre runs. On these first runs they were the only drivers using this softer tyre. Bottas would go quickest with a 1m:30.124 running on the medium tyre. The top ten times were all on the medium tyre with the Williams drivers now 18th and 20th with 15 minutes of the session completed. Verstappen was now third followed by Hamilton, Vettel, Gasly, Sainz, Magnussen, Hulkenberg, and Norris tenth. Hamilton would move into third. With an hour and five minutes remaining both Ferrari's were out on the supersoft tyre. A 1m:28.942 from Vettel sees him go quickest with Leclerc second. Both Mercedes were now out for their supersoft tyre runs. Both Williams were also back out again on the supersoft tyre and would see improved times from both with the pair now 18th and 20th. Hamilton was now in third followed by Bottas, Hulkenberg, Verstappen, Magnussen, and Norris eighth. A 1m:28.846 from Vettel with Leclerc still second. Ten minutes remaining and drivers were now on longer runs while the Williams drivers were still 19th and 20th. The Williams drivers were now running split tyre runs on the hard and medium tyre. The session would draw to a close with the top ten remaining the same. Both Williams drivers would pit with the end of the session having completed long runs on the two tyres. Again they were slowest but the gap to the fastest car in front of them had come down from the same session in Australia. Robert would also come out also on the supersoft tyre. Robert would set a 1m:34.057 after his first run. Robert would be last and would pit after a eight lap run. With fifty five minutes remaining Robert would return again on the supersoft tyre. A 1m:32.932 from Robert on his first timed lap. He would remain 20th as the session progressed. Robert would pit after a five lap run. Robert would return for a further run still on the supersoft tyre. Robert would pit switching to the medium tyre having completed a nine lap run on the supersoft tyres. Robert would complete 14 laps on the medium tyre as he pitted with the end of the session. George would be first out for Williams running on the supersoft tyre. A 1m:32.513 on his first timed lap. George would pit after a five lap run. Russell was also back out again on the supersoft tyre. George would set a 1m:31.904 to move up the times. He would drop to 19th and would return for a further run again on the supersoft tyres. He would complete a eleven lap run before switching to the hard tyre. George would complete 12 laps on the hard tyre as he pitted.